Please note, we do not provide the cake. Special diets can be catered for. Just talk to us about any special needs or changes to the standard menu. Please read our Outside Food Policy. 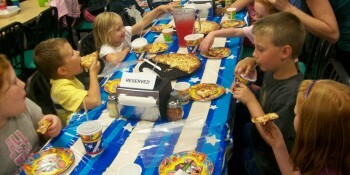 Parties utilise the entire Kids World area. Parties have the privacy of the party room, but the play area is open to all. Inflatables are part of Kids World and so they are included. Minimum of 6.